ORLANDO, Fla. – The No. 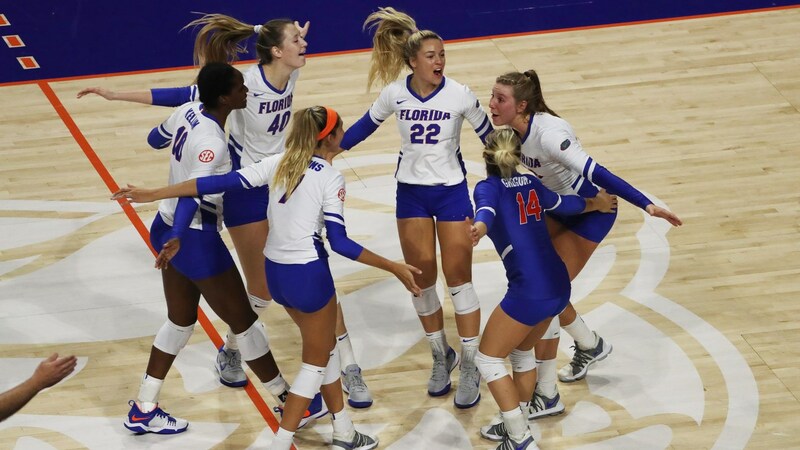 16 Florida Gators swept the Florida Gulf Coast Eagles on Friday night in The Venue during the second round of the NCAA Tournament. The Gators are moving on to the Regional Semifinal round for the 24th time in 29 trips to the tournament – all 24 coming under Mary Wise. End your night by watching the highlights & listening to the calls from tonight's SWEEP over FGCU to advance in the #NCAAVB Tournament! Allie Monserez dished a team-leading 20 assists – her 30th time leading the Gators in that category this season. Marlie Monserez also added 16 assists on the evening. ORLANDO, Fla. – The No. 16 Florida women’s volleyball team (26-6) used its size and experience to produce a 25-17, 25-13, 25-17 win over FGCU (27-7) in a second round NCAA tournament match on Friday at The Venue on the campus of UCF. The defending national runner-up Gators produced a starting lineup that included five players at 6-1 or above, including 6-8 Rachael Kramer and 6-7 Holly Carlton. They will advance to next weekend’s regional tournament, while the Green and Blue conclude the best season in program history. Sophomore Cortney VanLiew had a team-high 12 kills along with four digs and one block assist. Maggie Rick and Chelsey Lockey (Eaton, Colo./Eaton HS) had 12 assists apiece, while Dana Axner had 17 digs and the team’s lone ace. Kaitlan Krivdo (Hope Mills, N.C./Gray’s Creek HS) contributed a team-high two blocks (one solo) in her collegiate finale. Early on, FGCU handled any nerves they had pretty well by jumping out to a 7-3 lead. Florida responded with five straight to force a timeout before the teams went back-and-forth with the Gators holding a 15-14 lead midway through the set. At that point, however, four straight kills spurred a 9-1 run for Florida that allowed them to eventually claim the opening set. The teams exchanged the first four points of the next set, but Florida scored four straight and 14 of the next 19 to seize a 16-7 lead. Following that, they closed the set on a 6-2 run to take a 2-0 lead. The final set featured a 7-0 run from the Gators late in the set after FGCU pulled within 17-15 on a kill from Snowy Burnam (Palm City, Fla./Jensen Beach HS). Paige Hammons, who had a match-high 14 kills over 32 attempts, sent Florida to the round of 16 with the match-winning attack. FGCU concluded its season by tying the 2016 team’s Division-I era single-season wins record. It was the first NCAA Tournament appearance in program history, and they earned the conference’s first tournament win since 2003. Additionally, the team’s 16-match winning streak was snapped, but not before tying the Division-I era record – joining the 2012 and 2016 teams. With her offensive output, VanLiew (Seymour, Ind./Columbus East HS) finished the season with 482 kills – just three shy of matching Amanda Carroll‘s (Albuquerque, N.M./Sandia HS) single season record set in 2016. She did shatter Carroll’s (1,193, 2015) single-season record for attack attempts with 1,341, though. Rick (Alpharetta, Ga./Blessed Trinity Catholic HS) finished her career as the program’s all-time leader in assists (4,540) and matches played (131). She tallied double-digits in all every career match. Sharonda Pickering (Sea Cow’s Bay, Tortola, British Virgin Islands/Elmore Stoutt HS) finished with a .419 hitting percentage, which breaks the program’s single-season record previously held by Cara Ziegler (.416, 2007). She fell just shy of Ziegler’s (.403, 2006-07) career record, though, and finished her career at .399. Axner (Dublin, Ohio/Dublin Coffman HS) concluded her freshman campaign with a single-season record 624 digs, surpassing Whitney Hendry’s 606 from 2005.